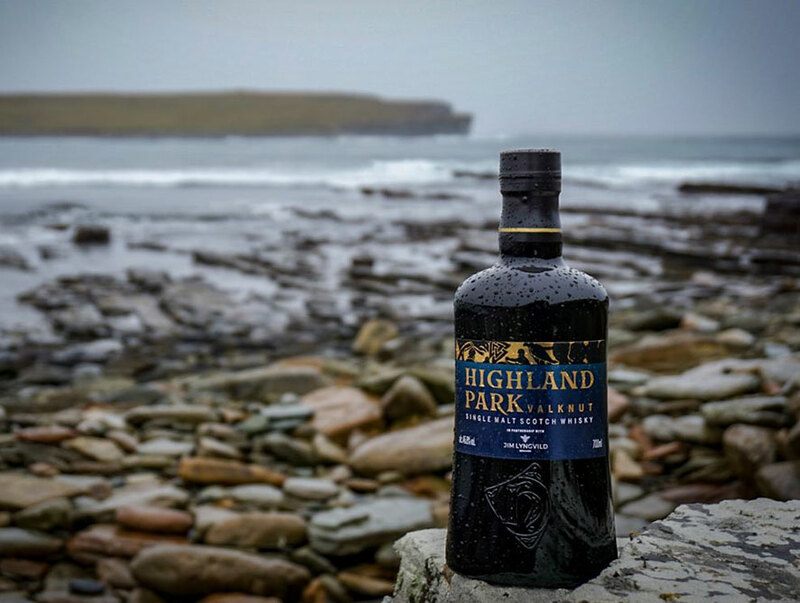 The Highland Park VIKING LEGEND Series releases are inspired by Orkney’s rich Viking history and mythology. The three fine Highland Park Single Malt whiskies in this limited-edition series are Valkyrie, Valknut and Valfather. In partnership with renowned Danish designer Jim Lynvgild, VALKYRIE is the first in a series of three VIKING LEGEND releases inspired by Orkney’s rich Viking history and mythology. Plunging down from the dark heavens, the Valkyries would descend like avenging angels on horseback to comb the battlefields for the bravest of the fallen warriors, heroes fit to enter the great Norse god Odin’s hall, Valhalla. VALKYRIE celebrates the Vikings rich Nordic ancestry on Orkney, where they were once part of a vast Viking kingdom. Its unique packaging was designed by internationally renowned designer and Viking Soul, Jim Lyngvild. Exquisitely balanced and delivering wave upon wave of warm aromatic smoke and richly ripened fruit, VALKYRIE the first in a series of three special Viking Legend Special Releases was awarded the Chairman’s Trophy in the 2017 Ultimate Spirits Challenge, scoring 99 out of 100. Having once been part of Denmark and Norway, Orkney became the raiding headquarters for Norwegian Vikings in the 8th and 9th century, shaping a unique past for the island. Magnus Eunson, who founded Highland Park in 1798, was a direct descendent of those first Viking pioneers. Even today, 1 in 3 Orkney islanders bear Scandinavian DNA and share a fierce pride for the rich Nordic ancestry woven into the islands’ traditions and culture. It is this enduring culture and legacy that is the inspiration for VALKYRIE. Valkyrie’s unique one-off design is inspired by two important Nordic sources – a typical Viking pendant from around 300-700AD discovered in Uppland, Sweden and the ancient Hammar Stone of Gotland which details the epic journey of the Valkyries. In his distinctive style, Lynvgild has interpreted the ancient legend of the Valkyries – avenging horse-backed angels who combed the battlefields for the bravest of their fallen warriors – in an expressive, story-telling illustration for Highland Park. 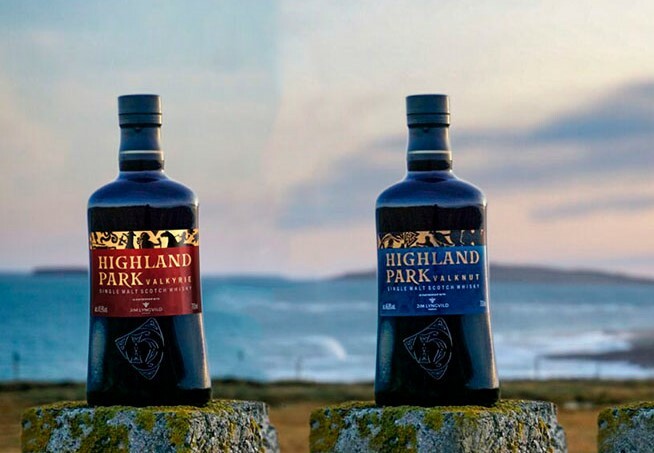 Noticeably different from the traditional black and silver Highland Park packaging, the re-imagined design maintains the distillery’s ongoing references to Viking design whilst updating the graphics with a bolder, hand-drawn aesthetic created by Jim Lyngvild. Jim is a Danish designer and a true Viking. His Viking lineage includes his 36th great grandfather Ragnvald Eysteinsson who was the 1st Earl of the Orkney Islands. He can trace back his family tree all the way back to the 8th century. Using embossed metallic detailing, Jim represents the Valkyries as shield-maidens of Odin, offering their god a drink of mead from a curved horn. The larger illustration features a winged Valkyrie with coiled hair and a necklace that pays homage to the goddess Freya’s magical Brísingamen torc (necklace). 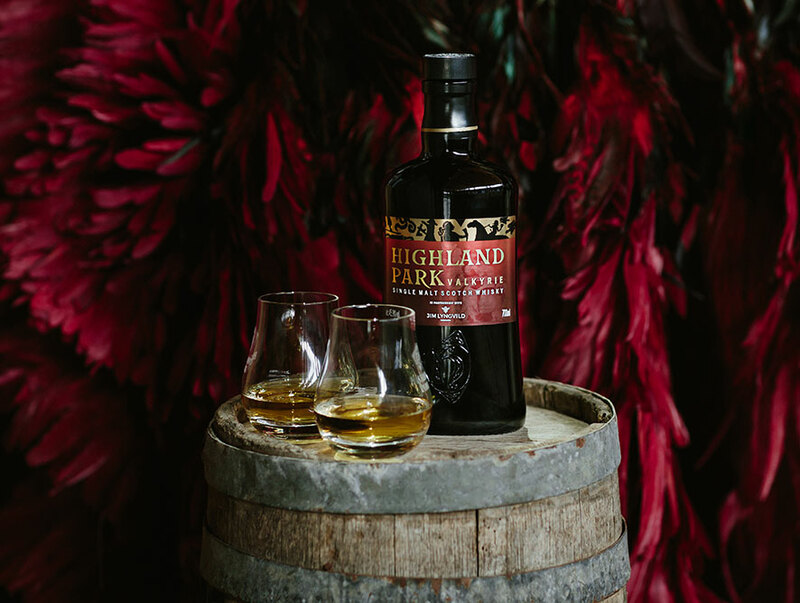 The whisky itself, created by Highland Park’s Master Whisky Maker, Gordon Motion, dials up more of their smoky notes by incorporating more of their heathery peated malt. This creates a richer, fuller phenolic note that has balance due to the sweeter, heathery character of our moorland peat but it is a slight departure from our core 12-Year-Old whisky. Palate: A bewitching mix of oriental spices. Predominantly driven by American Oak sherry-seasoned casks and Bourbon casks, the flavour profile is creamy vanilla with spicy, sweet, preserved ginger and lingering smokiness with hints of liquorice. Finish: Exquisitely balanced, the long and lingering finish delivers waves of warm aromatic smoke and richly ripened fruit. VALKYRE has been available in Australia since late last year and there is limited stock available. However, once this first release of the VIKING LEGEND series run out, there will be no more. According to legend, Vikings who met a fine and honourable death were marked out by the symbol of theVALKNUT and spirited away from the mortal world to the heavenly realm of Valhalla. Highland Park VALKNUT is the second in a series of three VIKING LEGEND releases. VALKNUT means ‘knot of those slain in battle’ and its symbol of three interlinked triangles appears on numerous artefacts from the Viking Age. The symbol is closely associated with the Norse god, Odin, who guided the spirits of the dead to the underworld (Valhalla) and back to the world of the living and is believed to represent the transition from life to death or the connection between earthly life and heavenly life. VALKNUT is an intensely balanced whisky with an ABV of 46.8%. It’s been matured predominantly in American sherry seasoned oak casks with a slightly higher phenolic level, compared to Valkyrie. They’ve also used a small amount of Orkney grown Tartan barley which adds to its smokier edge and lingering sweet, spicy finish. Finish: Intensely balanced, bold and courageous, leaves a lingering memory of aromatic peat smoke and sweet spices. Limited stock of VALKNUT is now available. Don’t miss out on your opportunity to get the 2nd release in the VIKING LEGEND series. Highland Park VALFATHER, the third and final release of the VIKING LEGEND series will be available later this year. More details to come. Make sure you don’t miss out on the opportunity to buy these as a Collection. As a Limited Edition release, the Highland Park VIKING LEGEND whiskies are a collectable series. Click here for more information on Highland Park Single Malt Whiskies.